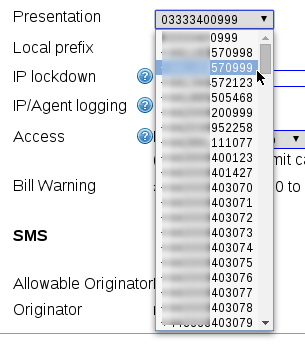 On the Control Pages there is some control over the number that is presented when you make a call out. Normally it is the number you are using, but this can be changed. Customers are able to pick another number that is on the same account as the presentation number. We can also set up a secondary presentation number as well which is allowed from your equipment. Alternatively, staff can set something other than your phone number here. There is a one-off charge for this and we'll need paperwork to prove the number is yours. You can set the presentation name (which in general will only be sent to other AAISP VoIP customers) on the 'Outgoing' tab of the control panel.